What does the Paris Agreement mean for geoengineering? Ahead of the UN climate change talks in Paris in December, Andy Parker (Research Fellow at the Institute for Advanced Sustainability Studies) and I published a blog post about geoengineering. ‘Geoengineering’ refers to a suite of techniques to reduce global warming by deliberately intervening in the Earth’s climate system. These techniques might either remove carbon dioxide from the atmosphere or reflect a small proportion of sunlight back into space. In our blog post, Andy and I warned against geoengineering being dangled as an alternative to cuts in greenhouse gas emissions and so distracting from the task of securing a global climate deal. Fortunately, the negotiations and resulting Paris Agreement on climate change (PDF) were not hijacked in this way. However, the Paris Agreement has high aspirations, and its overall goal – to ‘hold the increase in the global average temperature to well below 2°C above pre-industrial levels and to pursue efforts to limit the temperature increase to 1.5°C above pre-industrial levels’ – can’t help but put geoengineering firmly in the frame. The question that arises is how difficult – or even feasible – will it be to limit warming to 1.5 or even 2°C without some form of geoengineering? Answering this question is no easy task. But pointers have already come from the Intergovernmental Panel on Climate Change (IPCC) which published its Fifth Assessment Report in 2014. As described in Emma Woods’ blog post at the time, the IPCC did not shy away from the thorny issue of geoengineering. Particularly notable was its assertion that the more ambitious scenarios for mitigating climate change ‘typically rely on the availability and widespread deployment of BECCS and afforestation in the second half of the century’. BECCS, which stands for bioenergy with carbon capture and storage, is one example of a carbon dioxide removal (CDR) technology. It involves burning biomass to generate electricity, capturing the carbon dioxide so produced, and then injecting that into geological reservoirs. Like all geoengineering techniques, BECCS is controversial, and its feasibility and potential scale are still uncertain. But the Paris Agreement also aims ‘to achieve a balance between anthropogenic emissions by sources and removals by sinks of greenhouse gases in the second half of this century’. This undoubtedly qualifies as a ‘more ambitious’ mitigation scenario, and such a goal instantly makes the CDR form of geoengineering an option that must be considered. but also more optimistic views such as ‘Some are saying that 1.5°C is an impossible target – it is not. Ambitious but possible pathways that include large amounts of tree planting, bioenergy carbon capture and storage can get us there’ (Professor Piers Forster, University of Leeds). Having led the Royal Society’s 2009 study and report on ‘Geoengineering the climate: science, governance and uncertainty’ and its 2011 report on ‘Solar radiation management: the governance of research’, I am also disappointed by the lack of operable mechanisms to achieve these worthy goals. Quite deliberately, our 2009 report did not conclude either in favour or, or against, geoengineering. Instead, it offered a clearer understanding of geoengineering technologies, many of which remain speculative, and sparked a necessary debate about them. With the Paris Agreement now in place, my own view is that while geoengineering can never be a satisfactory ‘solution’ to climate change, it might in time prove to be a useful complement to mitigation and adaptation efforts, especially for addressing the risks that arise from the greenhouse gases that we’ve already emitted. I also hope that the challenges thrown up by the Paris Agreement will help to open up discussions on the scientific and ethical issues around geoengineering research and governance. These should involve a much wider community, including the small island states and least developed countries which are most at risk from climate change and so strongly advocated the 1.5°C temperature limit in Paris. We need a clearer picture of what may really be achievable, and at what cost, and we need it soon. For more on the implications of the Paris Agreement, don’t miss our PolicyLab event on 23 February. As one of the people who co-signed that letter to the Independent, I strongly agree with the warning issued by Andy Parker and John Shepherd, referred to again here, against geoengineering being dangled as an alternative to cuts in greenhouse gas emissions and thus a distraction. 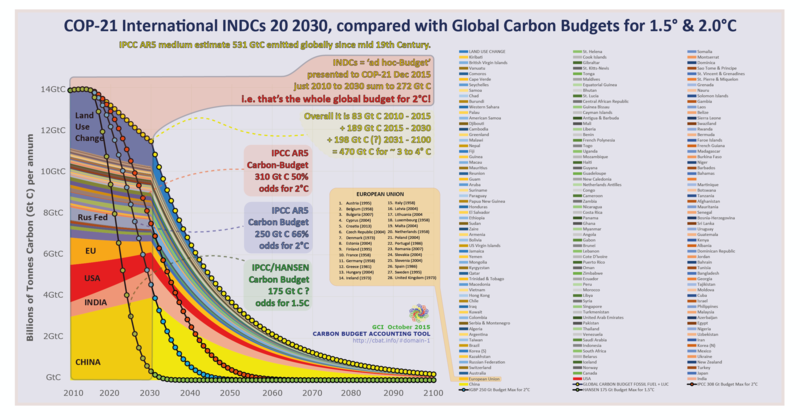 Using this detailed chart http://www.gci.org.uk/images/TIM_Tryout_2a.png he quantified the huge ‘gap’ between the INDCs on offer at Paris from UNFCCC Parties which were summed to 470 Gt C for 3° to 4°C, and what is needed to meet the Paris temperature targets, namely175 Gt C for 1.5°C with a 50% probability, 250 Gt C for 2.0°C 66% probability & 310 Gt C for 2.0°C with a 50% probability. This is the emissions contraction framework into which ‘geoengineering’ and BECCS and any other ‘low carbon’ technologies are put. 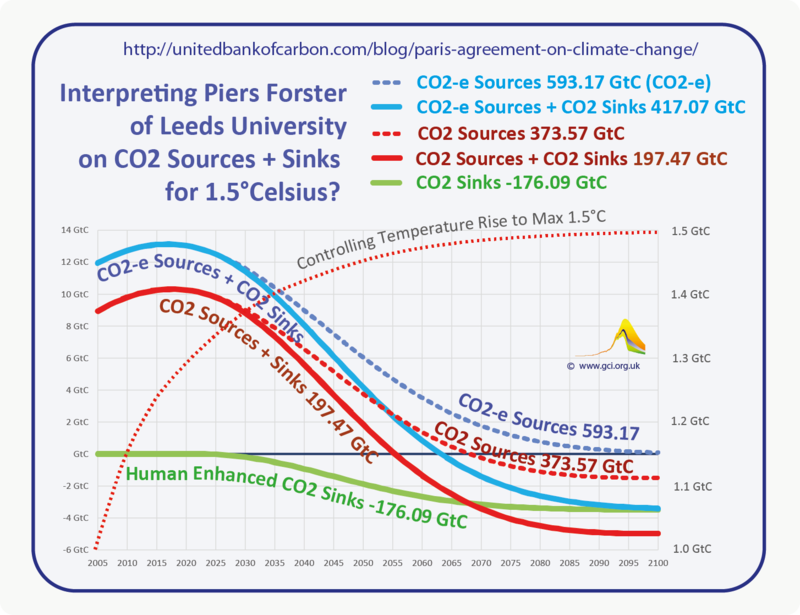 Piers Forster’s sink-enhancement scenario http://www.gci.org.uk/images/Leeds2a.png certainly looks ambitious. However, while these techniques may help this overall contraction framework, without a sufficiently rapid success in this primary and absolute requirement of UNFCCC-Compliance, what ‘facing a climate catastrophe’ tells us is that they will become distractions. Welcome to In Verba, the Royal Society's science policy blog. Please follow our community guidelines. The Royal Society's history of science blog. Highlights of the main activities happening at the Royal Society. See more ways to stay in touch with the Royal Society.